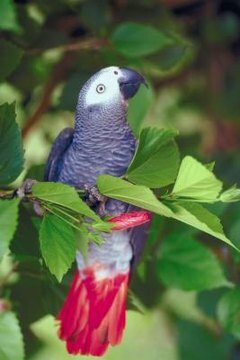 Since it's illegal to sell African gray parrots captured from the wild, available birds are usually bred in captivity. Fortunately, these smart, talkative parrots are generally easy to breed, as long as they've got a proper nest box in the cage. Shy breeding pairs spend nearly all of their time in the nest box if people are around. African gray parrots require deep nesting boxes. Avian veterinarian Dr. Susan Clubb's website recommends using a vertical, horizontal box with dimensions of 18-by-18-by-24-inches. A second choice could be an L-shaped box with similar dimensions. While such nest boxes are available for purchase, if you decide to build a nest box for your birds, make sure to use nontoxic and untreated woods. Your African gray breeding pair require a large cage. The minimum size should be 4-by-4-by-4-foot, or 3-by-3-by-6-foot. Provide at least two perches of natural woods for the birds. Mount the nest box as high in the cage as possible. You don't need to place bedding materials in the nest box. Females lay between two and five eggs per clutch.